Before August 2018 runs its course, I thought it appropriate to note that this month marks an even 180 years of the arrival of the first train in Tecumseh. The Palmyra & Jacksonburg Railroad a line constructed north from a Palmyra connection to the Toledo-Adrian line of Michigan’s first railroad, the Erie & Kalamazoo Railroad. The first P&J train arrived in Tecumseh on 09 August 1838. Tecumseh would then serve as the terminus of the line for several years, as the P&J’s money ran out and further construction northward was not possible at the time. 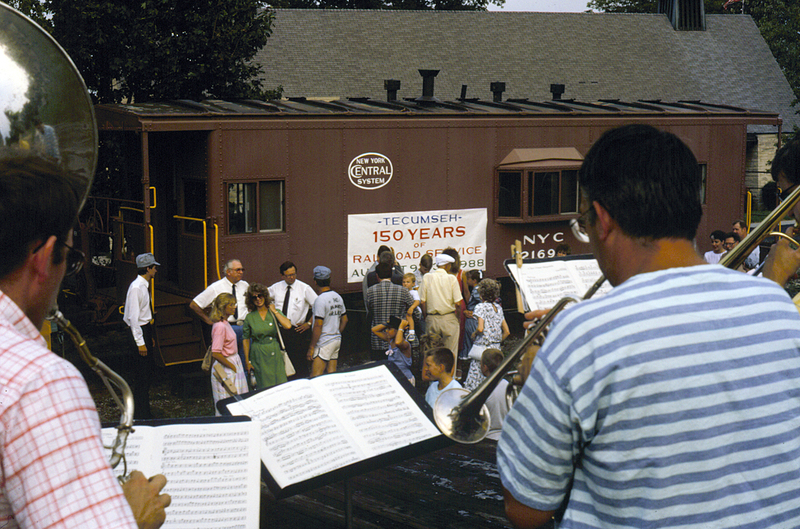 Thirty years ago, in 1988, the recently-formed Southern Michigan Railroad Society decided to mark the sesquicentennial of the event in a similarly grand way. Under the organization of then museum director Edward Hodges, the arrival of the first train was recreated, along with a band, speeches by politicians and a banquet (the Tecumseh Masonic Hall substituting for the long-gone Peninsular House). The SMR train of a locomotive and two cabooses was staged on the south side of Tecumseh, where the VIPs boarded. Following the train, a set of motor cars carried any members of the public interested in participating. 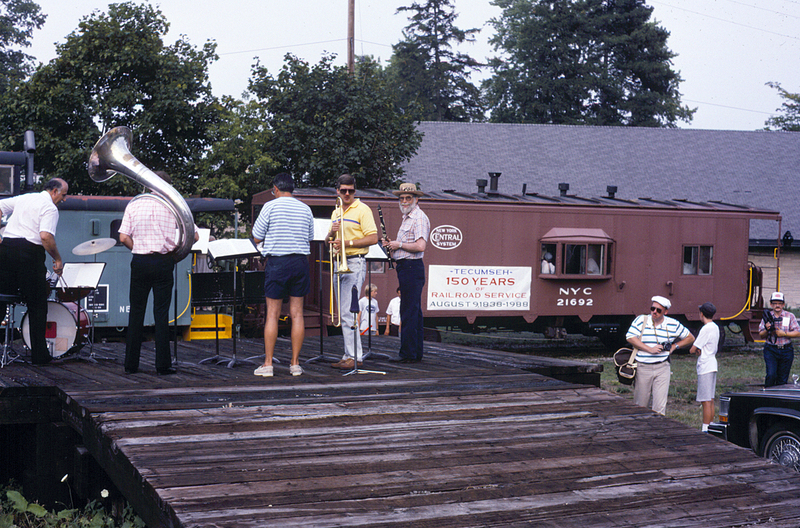 The train ran through north through downtown, arriving at the site of the old north depot (by St. Peter’s Church) to the sounds of Don Dobrowski’s jazz ensemble. From the back platform of the train, Ed Hodges greeted the attendees and gave a talk about the history of the railroad in Tecumseh and the importance of the occasion. This was followed by speeches by state senator Norm Shinkle and state representative Timothy Walburg. The speechmaking finished, the gathered crowd re-boarded the train for the short ride north to Brown Street. From there, it was a short walk on the warm summer night to the Masonic Hall. The festive banquet lasted several hours, with music and further speeches, including one from Tecumseh mayor Harold Easton. 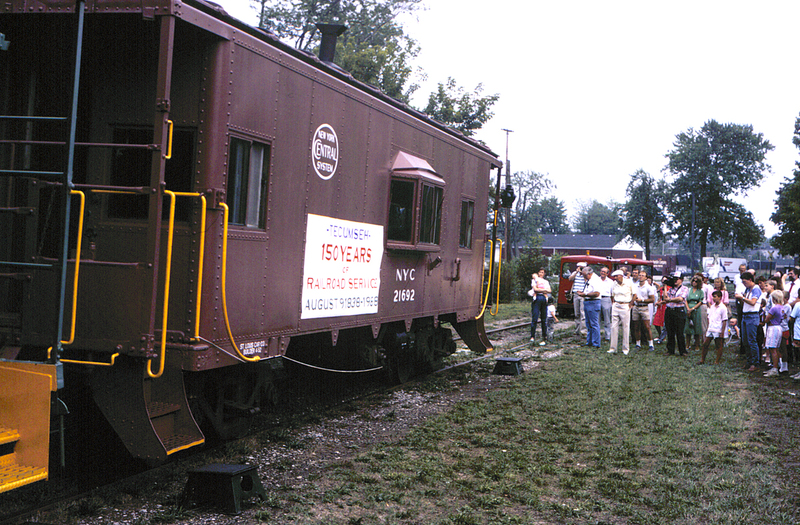 The SMR’s ex-New York Central caboose carried a banner commemorating the 150 years of rail service in Tecumseh, designed by Steve Slayton. The band plays as the crowd gathers. Don Dobrowski’s jazz ensemble played on the old railroad loading dock. This area was site of Tecumseh’s north railroad station, and the original terminus of the Palmyra & Jacksonburg Railroad. 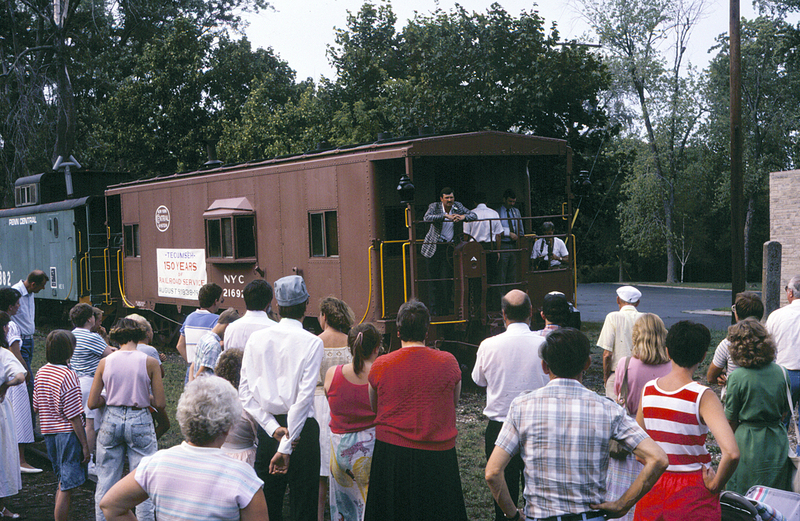 State senator Norm Shinkle addresses the crowd from the rear of the SMR caboose. Too bad the group can’t even manage to run a train let alone come close to doing these kind of events anymore. Maybe if they spent a little more time on community outreach and were more open about their internal workings they would not chase away so many volunteers.